187? opened branch line Garracoop *Nababiep 8m/13km. NOTE: Much of the text in this section comes from Chapter 4 of the late Jose Burman's book "Early Railways at the Cape" published in 1984 by Human & Rousseau. The railway select committee of 1854, apart from inquiring into the Wellington railway, made one very interesting statement, namely "that in our unanimous opinion the recent discoveries of valuable and extensive mineral deposits in Namaqualand have opened up a field for successful railway speculation such as South Africa has never before presented". They were referring to the copper mines recently opened in the O'okiep area. The knowledge that there was copper near Springbok was not something new; in fact, Simon van der Stel had made an epic journey in 1685 specifically to see the copper of which the Hottentots spoke. It was quite an expedition he led, for it consisted of fifteen wagons, eight carts, his personal carriage and 289 oxen. Well over one hundred men took part in it, and they reached the copper hills 57 days after leaving Table Bay. To his pleased surprise, Simon's miners found copper in two shafts they dug. The problem was transport, and Van der Stel spent weeks of his return journey investigating the coastline for a suitable harbour to which the copper could be transported. Unfortunately he began his search too far south and after examining Doring Bay, Lamberts Bay and Elands Bay, decided there was no suitable harbour. 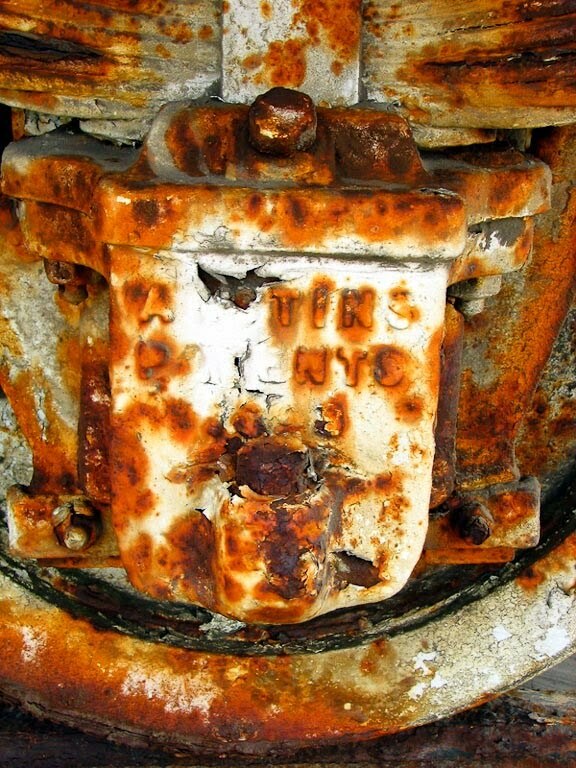 As a result, no attempt was made to work the copper for nearly 170 years. In the early 1850s, however, the price of copper rose dramatically and the Springbok area became a Mecca for fortune-seekers. The first 11 tons of copper was shipped from Hondeklip Bay in August 1852, and by 1854 over 1 000 tons was passing through Hondeklip Bay and Port Nolloth each year. Over 35 companies had been formed and one hundred mining licenses issued by 1855. Every ounce of copper had to be transported from Springbok over the mountains and across the sand-hills to Hondeklip Bay or Port Nolloth. At first oxen were used, and many a Namaqualand farmer soon owed the best part of his living to his earnings as a carrier. But the roads were in shocking condition, and with the advent of drought (which destroyed the grazing) and lung sickness the transport position deteriorated steadily. "Without some grand improvements in the roads the mining companies can never advance. Hundreds of tons of ore are at the mines which the proprietors cannot get conveyed to the coast at any price . ."
Bain recommended a tramway for traction by horses from the coast to the mountains. 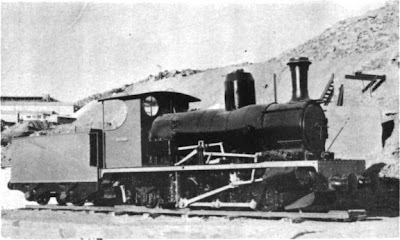 Charles Bell, the Surveyor-General, also made an inspection and reported that he thought Hondeklip Bay too far south for a direct connection with the copper mines, and did not approve of Bain's suggestion of animal-drawn trains. He recommended a railway from Port Nolloth (then called Robbe Bay) to Oograbies with branches from that point; the centre extension would have led eastward to Klipvleiberg - almost identical with the route finally adopted. The third authority to give his opinion on the Namaqualand transport was the geological surveyor, Andrew Wiley. In 1857 he advised the use of a railway from Hondeklip Bay, with two small locomotives. By 1862 there were only two copper companies left - the Cape of Good Hope Copper Mining Company, and the Namaqualand Copper Company. In that year a firm of British consulting engineers, John Taylor & Sons, applied on behalf of the Cape of Good Hope Copper Mining Company for authority to build a line from Hondeklip Bay to Riethaus which lies 25 kilometres away. The line was to be narrow-gauge - 30 inches (762 millimetres) wide - and permission to build this line was given in 1865. The line was never built. Instead, during the same year, the Cape of Good Hope Copper Mining Company briefed Richard Thomas Hall to investigate the transport problem. Hall was the engineer in charge of the Redruth & Chasewater Railway Company in Britain on which steam traction had been introduced. The connecting link was that John Taylor & Sons, the consulting engineers of the Cape of Good Hope Copper Mining Company, were also consulting engineers to the Redruth & Chasewater Railway Company. Hall came to Namaqualand in 1865 and advised the company not to proceed with the Hondeklip Bay line but, instead, to build a line from Port Nolloth to Muishondfontein (now named Anenous) at the foot of the mountains to the east. It was not until 1869, however, that the necessary Act of Parliament was passed, and the company was free to start work. By then copper to the value of over £150 000 had accumulated at the mine. Hall returned to Namaqualand and was appointed engineer in charge of construction. 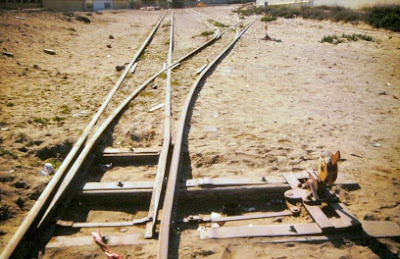 April 1994 - some of the narrow gauge tracks were still visible in Port Nolloth town. The first rail was laid on 4th September 1869, and so fast did construction progress that by 23rd December 1870 the line had reached Muishondfontein 77 kilometres from the sea, at an altitude of 487 metres above sea level. The line was to be a tramway for animal-drawn traffic, and was constructed on the 30-inch gauge, with light rails bolted to longitudinal sleepers of creosoted European pine, so as to allow free passage to animals working on the line. 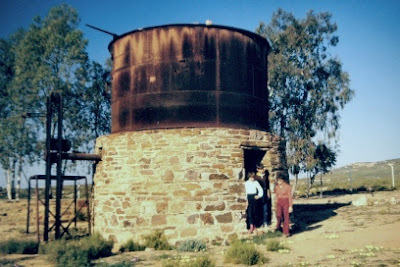 April 1994 - another watertank relic along the narrow gauge line route - this one is west of Anenous Pass on the way to Port Nolloth. Even so the speed of the operation was a triumph. For the first 14 kilometres it traversed a loose sandy plain, with ridges of blowing sand; at the 24-kilometre mark the line passed through the first range of mountains at Oograbies Poort. Here the line entered a valley up to 13 kilometres wide, which it followed all the way to Muishondfontein - or Anenous, as it was now renamed. The works on the line were trifling, even rivers costing little to cross; the Kama River which is 91 metres wide, was crossed on the sandy river bottom. Mr Hall's reasoning was that it would be cheaper to restore a small portion of the tramway in the event of a washaway, than to build a long and expensive bridge. As a result, the whole 77 kilometres cost only about £250 000. In order to reduce the extent of earthworks Hall followed the ground level wherever he could, so that the line undulated. The so-called "train" consisted of trucks in pairs pulled by four mules in tandem, and ten such units usually comprised a "train". From the start the tramway proved a great help and speeded up the transport of copper. But Mr Hall had other and more ambitious ideas, and during January 1871 a light locomotive engine (named the John King after the head of the first mining firm) arrived, and was tried out the following month. One of the major drawbacks of steam locomotives in Namaqualand was the shortage of water and that the engine was therefore compelled to draw a tender carrying enough water for a 32-kilometre run. Despite this handicap the engine was an immense success and was capable of doing work equivalent to that done by 500 mules. John King was soon joined by a second engine named The Miner, and the two of them ran regularly between Port Nolloth and Abbevlaack, drawing a gross weight of 20 tons up and 35 tons back to Port Nolloth. A very special difficulty soon arose, however. 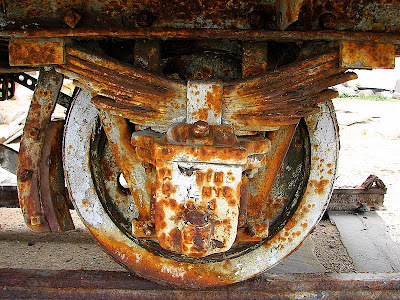 The train wheels which were only 16 inches (400 millimetres) in diameter, and made of rough cast iron, wore down very rapidly owing to the loose sand covering the rails. Within three weeks new wheels were needed. This problem was overcome by using wheels of cast Bessemer steel. The light construction, however, did not favour the use of steam, and most of the line remained a tramway for some years. In 1871 a further Act of Parliament was passed, permitting the extension of the limits of the line from Anenous to Kookfontein, near the Steinkopf Mission. This was only a distance of 19 kilometres, but it covered the climb through the mountains, a rise of 420 metres to the summit near Klipfontein. It involved gradients of up to 1 in 19. Standard steel-flanged rails of a heavier weight, laid on cross sleepers, were used on the mountain section. From the summit it was possible to couple the trucks together and run them down the mountain all the way to Port Nolloth by force of gravity, although this involved brakemen working lever brakes on each truck. Route of the Namaqualand copper mine line - click on map to enlarge. The last section of the line, a further 52 kilometres from Kookfontein to O'okiep, was authorised in 1873. There were no great problems on this section and the line to O'okiep was officially opened on 1st January 1876. A banquet was held that night to celebrate the occasion. The enabling Acts for the two lower sections of the line had carried conditions which authorised the Government to sanction junctions from other mines and to specify a tariff for the general public, and which prohibited the use of steam to convey passengers until the Colonial Engineer had issued a certificate of approval. The 1873 Act covering the line from Kookfontein to O'okiep, however, omitted these conditions, and the Government had no control over that section of the railway. The Cape of Good Hope Copper Mining Company neatly evaded all control by not taking paying passengers. Instead, they allowed people to use the line free of charge but at their own risk. In this way they were able to exact very heavy prices from their competitors, the Namaqualand Copper Company, for the use of the railway. Until 1893 the upper section of the line from Kookfontein was operated by mules, and from 1876 the whole line was once again operated by animal-drawn traffic. No more than two trains a day were run, and the journey took two days, the passengers sleeping at Klipfontein, where the company had built a hotel. "There are drops of over 2000feet. The road had been hewn out of the rock and there was just enough room for one man between the "Special" (the passenger coach) and the rocks. When we looked over the precipices we felt dizzy. The view was grand, but it was hard to enjoy it because we were terrified when we looked into the abyss beneath our feet . . . What if the road should cave in! What if the "Special" should be derailed! What if the mules should lose their footing!" At that time the company had 220 mules, 18 donkeys and 23 horses on its establishment. The Namaqualand railway: Company's "Special" coach mule-hauled on its way down the Anenous Mountains around 1880. Picture: J.F. Goch Album, South African Library, Cape Town. The "Specials" referred to by Bishop Simon were small four-wheeled trucks of one compartment only. Early in 1878 Mr Hodge took over as engineer and began converting the line for locomotives of sufficient power to cope with the exceptionally heavy gradients. This involved replacing the light rails with 14,5-kilogram steel rails laid on cross sleepers. The steam service was introduced gradually. Kitsons & Co of Leeds built special condensing engines (which obviated the necessity of carting extra water), the first of which was introduced on the section of 35 kilometres from Port Nolloth to Abbevlaack station on 1st August 1886. This was extended to Anenous on 1st June 1887. Clara, one of the 'mountain type' locomotives introduced in 1890 (from the private collection of H.R. Moffat, South African Library, Cape Town.). Over many years the tank-like appearance of these locomotives led to much confusion under rail experts - the fittings above the running board were not tanks, but covers, to protect the moving parts of the locomotive - today the plinthed locomotive is without these covers. In the photo the wheels are also behind covers, to protect these from the sandy conditions on the route in Namaqualand. This photo was taken by Frank Jux and published in the Rails to the Well article in the Industrial Railway Record of April 1968. It shows CLARA plinthed at the Nababeep mine. photo A.A. Jorgensen abt. 1980 - Clara as plinthed earlier at the Nababeep Mine. Writer Abraham A.J. 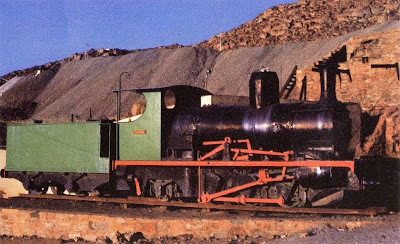 van Niekerk, who was born on the farm Koebees near Springbok in 1931, and who attended school in Springbok, in 1981 wrote: "One can still see one of these little locomotives. Her name is Clara, and stands, bravely polished, at the copper mine at Nababeep. As a child, I saw Clara pulling a load of milled copper quartz from Okiep to the smelting works at Nababeep. Old Mr Dowdle was the driver, and he had a sweeping yellow mustache and looked if he had stepped out of a picture book. Johnson was his stoker, I remember, and he had to hop off to open the gates, for where the railway line crossed the tarred road between Okiep and Nababeep motorists did not wait for the train - the train waited for them." The mountain section remained mule-operated until the arrival of specially built mountain engines of a heavier type which were introduced in 1890 and used to work the heaviest part of the route, from Anenous to Paddagat. April 1994 - a relic along the narrow gauge line route - this one along the N7 north of Okiep. Steam traction was finally extended to the whole line as far as O'okiep in 1893. By then the Namaqualand Copper Company had built a line from its mine at Concordia, linking with the O'okiep line at Brakput in 1889. Each morning a steam train would leave Port Nolloth, and another would leave O'okiep. 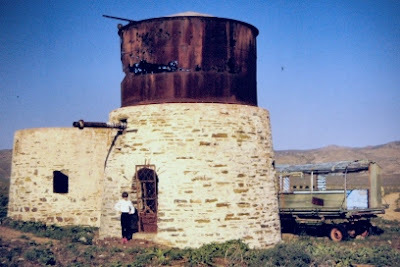 April 1994 - a watertank relic along the narrow gauge line route - this one is at Klipfontein on top of the Anenous pass. The trains crossed at Klipfontein station and each arrived at its destination at about 4.30 p.m. The up-train used to divide into two sections during the Klipfontein ascent, and the down-train adopted the same procedure at Vrieskloof. 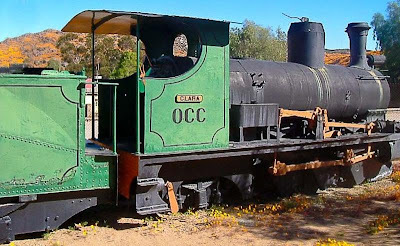 This little railway served not only the copper mines, but also the public, all the goods required for the Namaqualand shops traveled up on the train, and the produce of the country descended to sea level in its trucks. As already noted, the Namaqualand railway took no paying passengers, but it still made provision for people to travel on it. The early "Specials" were replaced in 1909 by a three-compartment coach with accommodation for a guard. This coach was fitted with a toilet - a new amenity on the line. There were also compartment coaches of a lighter design. 24 September 2006. 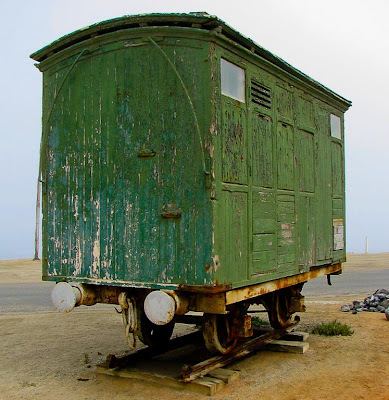 This relic of the railway is on display in Port Nolloth. Photo by potjie and posted to flickr. 24 September 2006. Photo by potjie and posted to flickr. Although the other private railways of the Cape were all taken over by the Government in due course, this fate did not befall the Namaqualand railway. True, there were proposals in 1880 and again in 1905 that the Government take it over, but these came to nothing. True, also, that the Namaqualand Copper Company's complaints at the exorbitant price it was charged for the use of the Cape of Good Hope Copper Mining Company's line culminated in 1900 in an Act authorising the Namaqualand Copper Company to build a line avoiding the upper section of the Namaqualand railway over which the Government had no control - but this, too, came to nothing. The period of our interest in this little railway ends in 1909 when it was still privately owned by the Cape of Good Hope Copper Mining Company. The line survived until 1945 when its new owners sold most of the line as scrap, since by that time the copper mined was traveling southward by road to Bitterfontein from where it was transported by the South African Railways. Today, if you travel along the route of the defunct Namaqualand railway you will see ruined stations, with empty water tanks, and kilometre after kilometre of deserted embankment - a silent tribute to the part played by railways in man's search for precious metals. 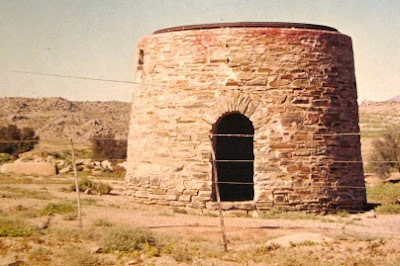 In the early 1850s, important deposits of copper were found in Namaqualand and this attracted many miners from Cornwall. Namaqualand lies south of the Orange River (the border with Namibia) and is very hot and dry, conditions which must have been a shock to the immigrants. In 1846, one prospector (not Cornish! ), abandoned his efforts because of the heat. The first speculative boom started in 1854/55. The copper was sent to Swansea for processing and a German chemist and mineralogist by the name of Albert von Schlich decided that he would bring Cornish miners back on the returning ships. They were sought after because of their expertise in hard rock mining. He settled them in a newly built village – Concordia – which, for a while, became a thriving community. In time, some of the wives and families came out to join them and an old Cornish tradition, taking pasties to work, was revived! The copper boom in Namaqualand did not last long and when the bubble burst in 1856, large numbers of the Cornish community went home. Of more than 40 companies which had been originally floated, only 3 survived. One of these was the partnership of Phillips and King who looked again to Cornwall for much needed mining expertise as their mining operations expanded. One of the biggest problems facing mining companies in Namaqualand – and many other mining areas – was getting the ore to ports so that it could be shipped to Europe. The Cape Copper Company employed Cornishman, Richard Thomas Hall, one time superintendent of the Redruth to Chacewater railway, to build a line from O’kiep to Port Nolloth. It was completed in 1876 and initially used steam engines, but, with the shortage of water, this was not practical so a mule train was used instead. The Namaqualand Mule Train was world famous in its day. The trains also carried passengers, but the journey was hazardous: carriages were open and there was a real risk that they could topple down the side of the mountain. When the train was climbing, they were expected to get out and help push, but going downhill safely meant relying on the alertness and strength of the brakesman! Dangerous and uncomfortable the journey might have been but having the railway meant not only that ore and passengers could be transported, but that provisions could be shipped in, making for a more comfortable life. The railway opened up opportunities for travel and leisure – although at times, the area must have seemed like the American Wild West: O’kiep was a town of dubious morals, Springbokfontein had a gaoler who was reputed to murder his inmates and Port Nolloth ‘echoed to the wild songs of a horde of thirsty Cornish miners’. 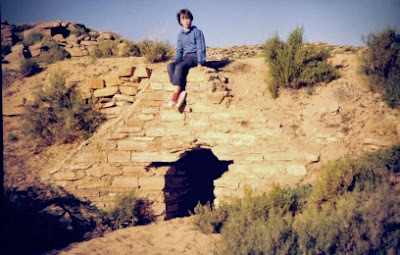 Even so, there was fun to be had in these towns - regular dances, race meetings, picnics, wrestling and carol singing were available and they could now go on excursions to see the spring flowers for which Namaqualand is famous. The Cornish introduced cricket to the area and matches were regularly held in the towns. After the railway was built, matches took place anywhere along the line where a team could be mustered!